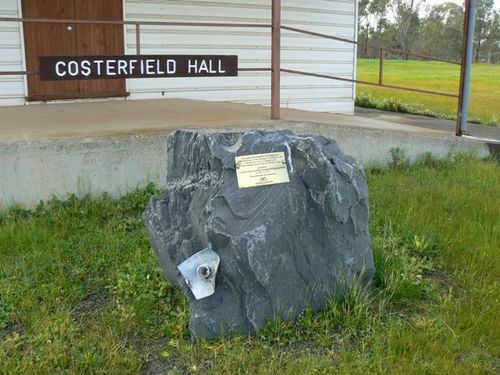 A monument commemorates the 150th anniversary of the founding of Costerfield in 1861. The Costerfield veins were discovered in the 1860s and have been mined for both gold and antimony, most extensively during two periods: 1860 – 1883 and 1904 – 1925. Ongoing exploration and intermittent small scale production continued during the period 1934 – 1980. Since 1983, the Costerfield deposits have undergone more extensive exploration, resulting in the construction of a processing plant in 1995 to re-treat tailings and the oxide portion of the Brunswick deposit which was mined by open pit methods. In the period 1975 – 1981 the Augusta deposit was discovered with continued exploration and resource definition drilling resulting in the completion of a successful feasibility study and development of the Augusta underground mine in 2006. Coster brothers, Edwin Field and William Youlle.